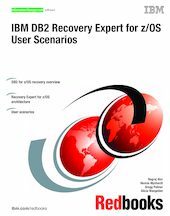 This IBM Redbooks publication describes the procedures for using IBM DB2 Recovery Expert for z/OS to manage the recovery of DB2 for z/OS objects in a data sharing and non-data sharing environment. IBM DB2 Recovery Expert for z/OS is an easy-to-use, automated recovery solution that enables database recovery operations with minimal disruption. Its graphical user interface (GUI) provides powerful reporting and automated recovery capabilities for productive database maintenance and high availability. This book is written for an audience of DB2 for z/OS database administrators (DBA). This book gives you an overview of DB2 Recovery Expert for z/OS, its main features, architecture, recovery semantics, and processing flow. It also describes some of the key considerations in choosing a particular topology to address a business requirement. We provide user scenarios with step-by-step approaches to recover single DB2 for z/OS objects, multiple DB2 for z/OS objects, dropped DB2 for z/OS tables, and DB2 for z/OS subsystems using the IBM Recovery Expert for z/OS tool. We discuss backup and recovery in a DB2 for z/OS environment, the types of failures that might occur, the types of recovery that are supported, the types of objects that can be recovered, the elements and tools of recovery, and the recovery flow. We also provide a brief tutorial of the DB2 Recovery Expert for z/OS GUI client and an overview of the schema level repository (SLR) with recommendations for its maintenance.